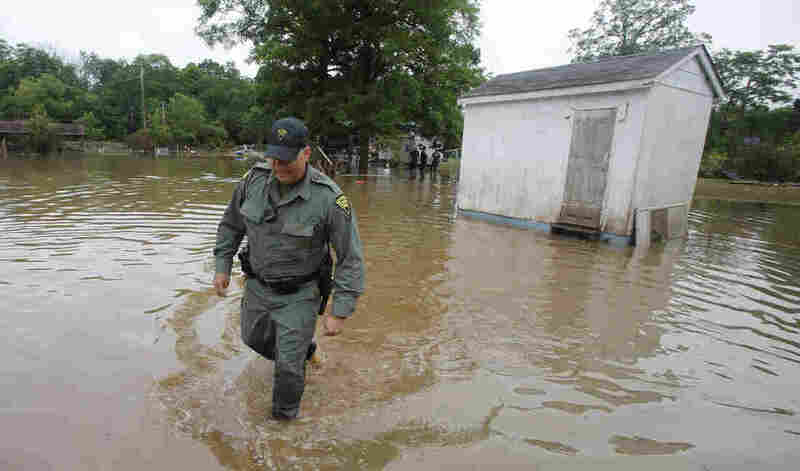 West Virginia Floods: President Obama Declares Major Disaster After Historic Flooding : The Two-Way The flooding has left at least 23 people dead and devastated communities. The historic floods are the worst in a century for some parts of the state. At least 100 homes were destroyed or damaged. West Virginia State Trooper C.S. Hartman walks from a shed that he checked out as he and other crews search homes on Saturday in Rainelle, W.Va.
President Obama has declared a major disaster in West Virginia after flash flooding left at least 23 people dead and devastated communities. The historic floods are the worst in a century for portions of the state, the governor has said, and destroyed or seriously damaged at least 100 homes. Water levels reached as high as rooftops in some areas. More than 30,000 people are without power, according to the state's Division of Homeland Security and Emergency Management. Obama's declaration makes funding available to three of the hardest-hit counties in the state – Greenbrier, Kanawha and Nicholas. It is meant to assist with "temporary housing and home repairs, low-cost loans to cover uninsured property losses, and other programs to help individuals and business owners recover from the effects of the disaster," according to a statement from the Federal Emergency Management Agency. "This federal support will provide much needed assistance to severely-impacted regions," West Virginia's governor Earl Ray Tomblin said in a statement. "As emergency response efforts continue, with members of the National Guard and local emergency responders hard at work helping our neighbors, we will continue pursuing additional assistance for all affected areas." This comes after FEMA officials toured some of the most impacted areas on foot and by air on Saturday, as West Virginia Public Broadcasting's Ashton Mara tells our Newscast unit. Until now, most of the rescue, cleanup and support efforts have come from local communities, as the member station's Kara Lofton reports on Weekend Edition Sunday. In the town of Clendenin, Lofton met Marsha Larch, who has lived in the same home for 50 years. Now, as Lofton reports, "stinking mud covered the surface of everything: recycling, furniture and even clothes that had washed out from the living room inside." Larch says she is forced to abandon her home because it is at risk of collapsing onto a riverbank. "I worked for 36 years for the power company and I retired and worked on my home and got it all ready and now it's gone," Larch adds. Less Mitch of the West Virginia FEMA Urban Search and Rescue Team tells Lofton that his team is still conducting searches for people trapped inside buildings. "You'll go from what looks to be normal, everyday houses," Mitch says, "to complete destruction, just the foundations left with nothing but mud." As of Saturday, emergency officials are shifting gears in most parts of the state from response to recovery, West Virginia Public Broadcasting reports. The PGA Tour announced that it has canceled an upcoming golf tournament in Greenbrier, one of the three counties Obama declared a major disaster. 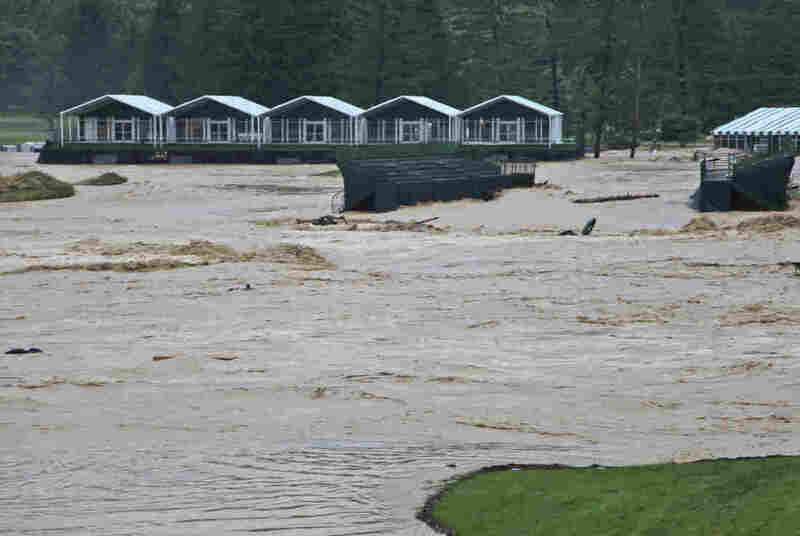 "We are heartbroken by the devastation that the residents of West Virginia are experiencing at this time and the reports of lives lost due to the terrible flooding," PGA Tour Commissioner Tim Finchem says in a statement. "All of our focus needs to be on helping all of the people of our great State. So many have lost loved ones, their homes, and have no place to go," says Jim Justice, owner of The Greenbrier.